Hello! For those that don't know, I met up with some of my favourite nail people over the weekend. We all bonded over our love of Danglefoot Nail Polish, so what better to wear? I went for 'Shake Your Tail Feather', originally released in the May 2016 Paint The Rainbow Box. The boxes have since been broken down into the separate polishes on Rainbow Connection, with all proceeds going to charity. I've had my bottle for months, but somehow still hadn't worn it. Read on for my swatch and more info! 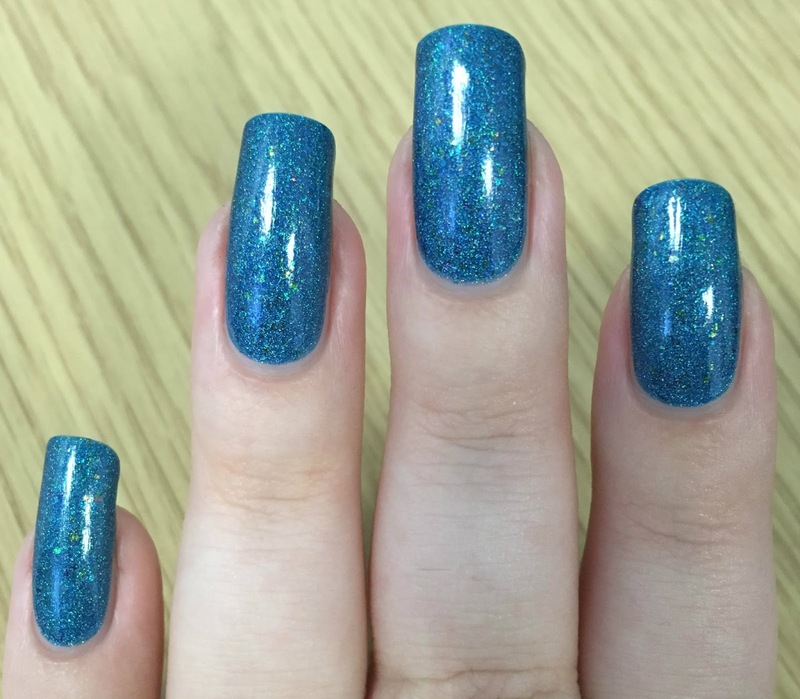 'Shake Your Tail Feather' is a blue holographic scattered with green flakies. The formula is amazing. 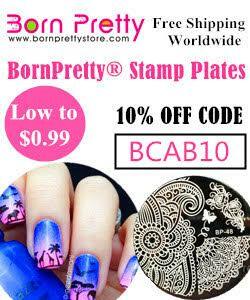 It is smooth and easy to apply, and fully opaque in two thin coats. The flakes lie perfectly smooth on the nail, so don't cause it to be textured. The holographic in this is intense! You don't have to be in direct sunlight to see it. Below is two coats and topcoat. What do you think? I don't know why I waited so long to wear this! It's gorgeous! I just love the addition of the green flakes and how easy they are to see on the nail. I did think about stamping some green ghosts over the top for a quick Halloween mani, but I just couldn't bring myself to cover it - maybe I'll have to wear it again before the end of October. 'Shake Your Tail Feather' is still available over on Rainbow Connection here. Everyone needs this so go go go! Danglefoot Nail Polish itself is currently closed, but Hayley is on Instagram here with updates and sneak peeks of new releases coming soon! Beautiful polish, and I love flakies that are smooth as you describe - they can be so hard to find! Wow! 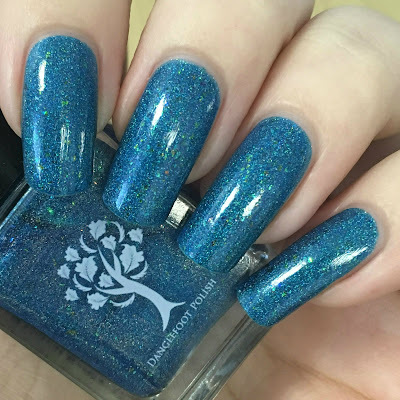 This shade is stunning! This colour is amazing & I love the idea of meeting up because of nail polish. Love blue and this is stunning! I love this polish! Wish we could get it here in the States.